Welcome to the games database of NDS Multi Carts Ltd.
Use the SEARCH options to find the games you like. Nintendo DS multi-game cartridges that can contain over 100 Nintendo DS games on a single regular DS game cartridge. Multi Game cartridges with Dual Screen games for the Dual Screen Nintendo console including DS, DSi, 3DS, New 2DS XL all all the variations of Nintendo dual-screen handhelds. The cartridges work on any Nintendo DS console from anywhere in the world, you do not need any extra software or accessories to play DS multi-game cartridges. 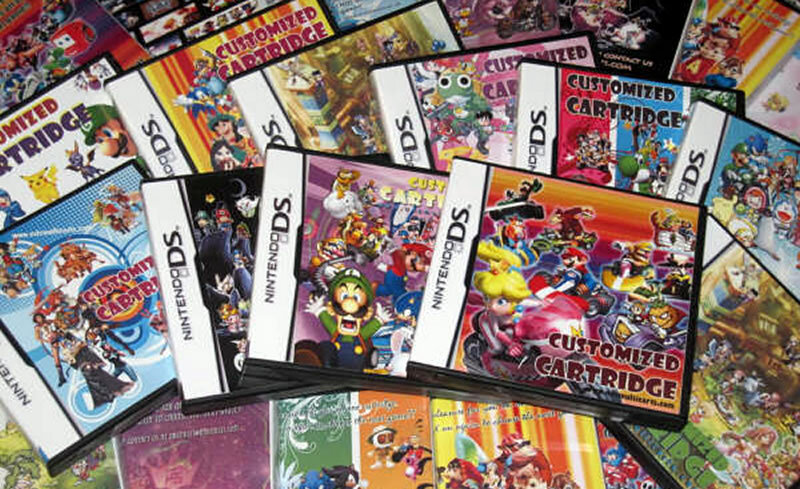 Simply insert the DS cartridge, choose the game you want to play from the menu and play. The games are the full complete games with all functions including multiplayer wifi and save games. Add them to the SHOPPING CART You can fill up your cart with either 220 Mblocks for the 2GB cartridge, or even to 440 Mblocks for a 4GB cartridge. Nintendo DS and the Nintendo DSi and DSi XL. We offer unlimited after sales e-mail support and an Existing Customers section (details below left). 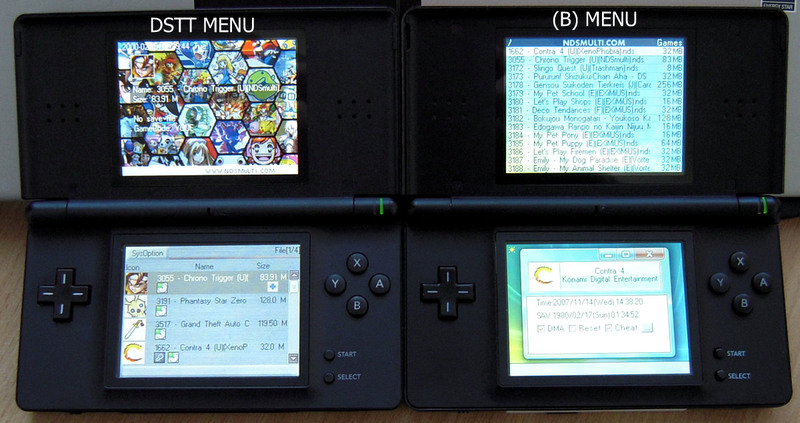 Please make sure you read the NDS Multi Games DS Info pages thoroughly before making your purchase. 1) Click on add to basket to order your package and we will email you your RC order number straight away. 2)	Please put your name and RC order number in the subject of the email. For more than one list then please indicate this by putting List 1 or 2 in the subject as well. 3)	Then copy & paste your Games choices from the Games List into the e-mail form on the top left hand side of this Choose Your Own page or from the Games List page. 4)	Please make sure that only the names of games are entered and on individual lines and there are no numbers or other writing included, only the name of the game. 5)	When you send your list, enter the RC order number we sent you as the subject of your e-mail so that we can tally your list to your order. 7)	Once we despatch your order we will send you confirmation and you can track your order by either entering your email and order number on the tracking page or by clicking on track my order to go to the Royal Mail website (Recommended) also on the tracking page. In the unlikely event you have problems then we have a returns policy and we also offer unlimited email support and a troubleshooting section for existing cutomers. HUGE SAVINGS ON DS GAMES!!! The cartridges work on any Nintendo DS, DS Lite or DSi console from anywhere in the world, you do not need any extra software or accessories to play DS multi-game cartridges. Simply insert the DS cartridge, choose the game you want to play from the menu and play. The games are the full complete games with all functions including multiplayer WiFi and save games all on a regular DS games cartridge. * The space on a cartridge is 16 Gigabit and that amounts to 220 memory blocks. The sizes of games vary from 1 to 16 memory blocks; so the minimum amount of games is 14 and the maximum on one cartridge is 220 games! You can pick a game from another region! As an English speaking customer it is wisest to order USA versions of a game. This because the JAP titles only have the Japanese language, and the EURO versions have more language options and this can make the game bigger in blocks size. To fill up the cartridge with the most titles, the USA versions are the best choice! M3 DS Simply, YushenDS Card, R4DS are similar products but are just differentiated using these names to classify them as the English, German, Chinese, and Japanese versions. This is because despite the language differences, all these cards can be automatically patched or fixed to be compatible with the brand or language versions of the hardware they are supposed to work with. The R4 card had an updated version, R4v2, that was released in early 2007 but this was again modified in late 2007 by getting the spring mechanism out that was to be used during the insertion of a microSD card. This modification was made to solve the reported problem about spring malfunction over time. These cards even face more issues with the influx of their clones in the market. YDC hardware has clones that used names such as N5, NPlayer, E7, MARS, ND1, and U2DS plus other R4 inspired names such as New R4, R4 Advance, R4DS-Upgrade 2, R4 Deluxe, R4 Ultra, R4 SDHC, R4 DS III, and R4 Pro. Clones also used the fake firmware for YDC cards though such a scheme was stopped in 2007. This was why the clones such as N5 and others only used decrypted firmware while R4 can still use the encrypted fake firmware. The genuine YDC firmware was even bravely modified by some manufacturers of the clone YDS items so as to be compatible with many other games while others completely scrapped away the YDS firmware to give way to their homebrew loaders like the YSMenu that they have come up with. These cards are all second generation devices or SLOT-1 solutions that support microSD for storage. They also boast of features such as auto-DLDI patching, Action Replay cheats, Nintendo Wi-Fi connection, and download play. They all support the use of Moonshell media player that is already slated in the main menu of the cards. In August 2007, the cards’ developers decided to take out the spring from the slot where the memory card is to be inserted to solve complaints regarding its malfunction. The developers decided to halt the production of R4 and the last firmware update was done on April 23, 2008. However, some clone manufacturers continued to use R4’s firmware still. When the cloning and piracy problems regarding R4 were not still solved, Japan banned its sale in the country. A lawsuit was filed against a distributor that continued to sell R4 cards and Nintendo won the case. R4 still has not been completely upgraded as it is still incompatible with SDHC cards but clone manufacturers managed to solve this incompatibility issue. However, there are still flaws and issues with these clone R4s that reportedly managed to make it work with SDHC card. Due to the clones present in the market, it is already a difficult task to find a real R4DS card and to even recognize one among the clones for sale. Anyhow, this card is already considered as outdated relative to the newer cards that have just been released. With the release of DSi XL console, the R4 developers also released R4i Gold and R4i in March 2010. Recent developments related to N5 are said to include the development and release of the N5i to work with NDSL or NDSi. We can honestly say that you will not be disappointed with the games you get or the service we offer. If you have any reservations on my service, we do offer a 100% refund if you are not happy or the games do not arrive. We have been selling games for over 10 years, starting up on with over 9,000 feedbacks, so you can have trust in us to deliver what you pay for! List of games included in the Pokemon and Mario time machine multicart with classic NES and GAMEBOY COLOR games for DS / 3DS / 2DS : Mario's Picross (UE) [S][! ].gbMario's Time Machine! (U).nesPokemon - Blue Version (UE) [S][! ].gbPokemon - Crystal Version (UE) (V1.1) [C][! ].gbcPokemon - Gold Version (UE) [C][! ].gbcPokemon - Silver Version (UE) [C][! ].gbcPokemon - Yellow Version (UE) [C][! ].gbcPokemon Diamond (U) [p1][C][! ].gbcPokemon Green (U) [p1][! ].gbPokemon Pinball (U) [C][! ].gbcPokemon Puzzle Challenge (U) [C][! ].gbcPokemon Red (UE) [S][! ].gbPokemon Red Advanced (U) [S][p1][! ].gbPokemon Trading Card Game (U) [C][! ].gbcSonic 7 (Unl) [C].gbcSuper Mario Bros. 2 (U) (PRG0) [! ].nesSuper Mario Bros. 3 (U) (PRG0) [! ].nesSuper Mario Bros. + Duck Hunt (U).nesSuper Mario Bros. + Duck Hunt + World Class Track Meet (U).nesSuper Mario Land 2 - 6 Golden Coins (UE) (V1.0) [! ].gbSuper Mario Bros. Deluxe (U) (V1.0) [C][! ].gbcSuper Mario Land (JUE) (V1.0) [! ].gbWario Land - Super Mario Land 3 (JUE) [! ].gbWario Land 3 (JU) (M2) [C][! ].gbcWario Blast Featuring Bomberman! (U) [S][! ].gbWario Land II (UE) [S][! ].gbWario's Woods (U) [! ].nes .